Proposed Keystone XL oil pipeline would stretch over 1,300 miles from the southern leg from Cushing, Oklahoma to the Gulf Coast. 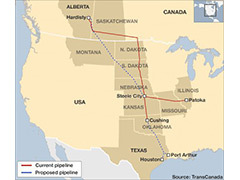 The pipeline’s sponsor, TransCanada Corp. (TRP), asked for permission from the State Department to build the pipeline and connect the oil sands of Alberta with refineries along the gulf.The whole project has been a consistent source of debate and controversy as the U.S. tries to confront its oil addiction. That debate is taking on more dimensions as a Texas-based architectural firm presents a plan to build a bike path along the pipeline—and across the bulk of the country. Houston’s SWA Group, led by creative director Kinder Baumgardner, made their claim to fame when they designed Google Inc’s corporate campus. Now, Baumgardner is applying that same grand-scale approach to Keystone with extra doses of ambition and audacity. Or, is the whole idea just “lipstick on a pig” as some commenters like to put it? On October 17, the firm sent a proposal letter to the State Department and TransCanada complete with hokey illustrations of smiling bicyclists riding over buried pipe. The cyclists pass a farmer’s market, Native American teepees, cows, sunflower fields and a protester in a tree. “To us,” said Baumgardner as he spoke on behalf of his creative team, “it was ridiculous that you would go through all the effort and it would have only one use.”But, not everyone agrees. Other factors to consider: Although the cost of is expected to soar into the $400 million range, it would create a lot of jobs and opportunity as hotels and restaurants could start popping up along the path. We suppose, as the consensus seems to be, that if the pipeline is going down anyway, the bike pathway may as well add more utility. Feel free to write in or comment and tell us what you think about the whole thing.